Jesica Amescua and Mariana Ordóñez Grajales, Comunal: Taller de Arquitectura, Mexico City Stephanie Davidson, George Rafailidis, Davidson Rafailidis, Buffalo Introduced by Stella Betts 1.5 AIA and New York State CEUs The third evening of the annual Emerging Voices lecture series. Emerging Voices spotlights individuals and firms based in the United States, Canada, or Mexico with distinct design voices and the potential to influence the disciplines of architecture, landscape architecture, and urbanism. Founded in 2015, Mexico City-based Comunal: Taller de Arquitectura provides design services to underserved communities. Their work centers around five methodological axes which they feel are fundamental to “developing inclusive, participatory, and contexutal projects.” Recent work includes Childbirth Houses, designs for midwife workspaces informed by extensive dialogue with an indigenous Chiapas community; and Territory and Inhabitant, a research project for a house that could be built in Yucatán for less than $10,000. Stephanie Davidson and Georg Rafailidis established Davidson Rafailidis in 2008. Both are members of the architecture faculty at the University of Buffalo and have also taught at the RWTH Aachen University in Germany and the University of Toronto. Recent projects include He, She & It, a structure with three distinct workspaces for a Buffalo couple; Café Fargo (Tipico Coffee), a coffee shop in a former corner store also in Buffalo; and Mirror, Mirror, the winner of a competition aimed at reimagining the street festival tent. Stella Betts is a co-founding Principal of the New York-based LEVENBETTS and a past Emerging Voices winner in 2009. She has taught at Columbia University Graduate School of Architecture, Planning and Preservation, The Cooper Union, and Cornell University’s College of Art, Architecture, and Planning, among other institutions. She served on this year’s Emerging Voices committee. 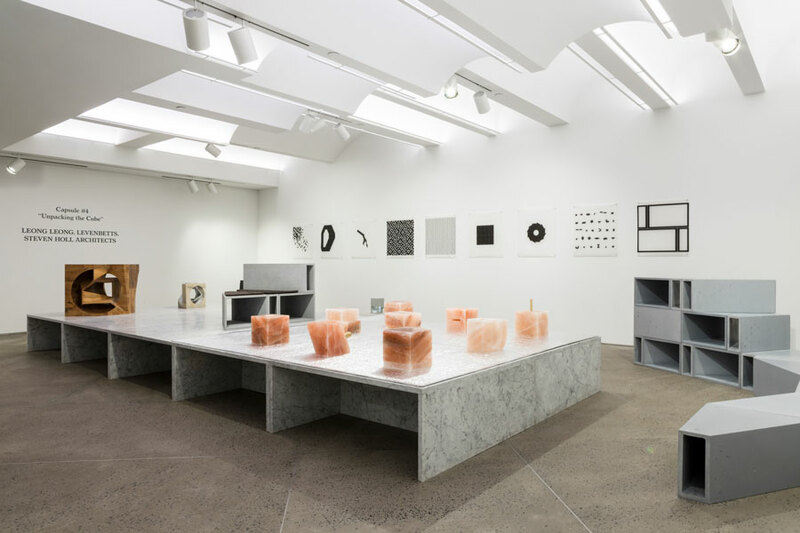 New York– and Los Angeles–based architecture firm Leong Leong's "A Toolkit for a Newer Age" is part of an exhibition at Chamber Gallery titled Unpacking the Cube which also includes work by Steven Holl and Levenbetts. Fabricated out of Himalayan pink salt, the collection of nine objects are designed to satisfy basic human needs, which "can be configured into a series of distinct constellations, alluding to ritualistic events that provide individual and communal opportunities for reflection and socialization" according to the designers. The shapes of the tools are milled by robots, which creates a juxtaposition between the ancient organic matter from which they are made and the advanced technology used to create them. Eventually the salt objects will begin to degrade, which emphasizes the nature of human tools and how quickly essential items become obsolete. The objects include a tiffin, mortar and pestle, seats, vessel, censer, salt block, candle, horn, and headrests, all of which are placed on an insulated mat. Additionally, Holl contributed three cubic sculptures made of concrete, aluminum, and walnut. Levenbetts, comprised of David Leven and Stella Betts, included a collection of hollow wedge shaped pieces that can be combined to create a cube, as well as seating and shelving units. The exhibition is curated by Andrew Zuckerman and runs through March 5, 2016. From the architects: "The brief stated that the book store accommodate events, therefore the perimeter of the space is wrapped with full height shelving, freeing up the interior as a flexible use space. Variously stacked display units provide table display space while doubling as informal loose seating for reading and events. A windowed office space is created by pinching and pulling shelves toward the center of the space while facing more of the shelves toward the storefront entry." 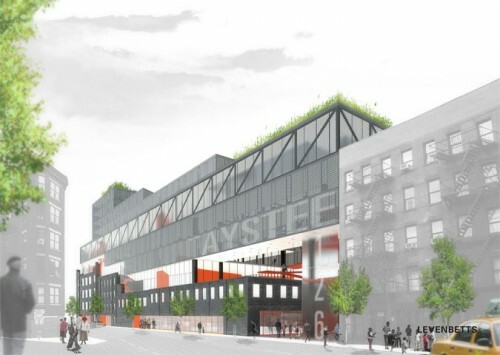 The New York City Economic Development Corporation announced Wednesday that the former Taystee Bakery site in Harlem will be redeveloped into a green, mixed-use structure featuring light manufacturing, artists and not-for-profit spaces, a local bank, an ice skating rink, and a local brewery. Project developers Janus Partners and Monadnock Construction asked LevenBetts Architecture to create a design that merges the eclectic program to create an economic and social center for the neighborhood. Called the CREATE @ Harlem Green, the new building will incorporate the masonry walls of the Taystee Bakery facility and add a new modern structure hovering atop the historic buildings. "We're rethinking the industrial building," said David Leven, partner at LevenBetts and director of graduate studies at Parsons. "What's left are big, heavy, dark buildings that have been abandoned or disused for some time. We're preserving what's left but opening the facades up to the street." Plans call for 100,000 square feet of new manufacturing space, 90,000 square feet of office space, 40,000 square feet of retail space, and 10,000 of community facility space, in total estimated to cost $100 million. Renderings revealed by LevenBetts may change as plans for the site are further developed, but Leven told AN that they represent a "well developed concept." The new structure, clad in perforated metal panels, mediates the scales of surrounding buildings, stepping down its height along 126th Street. Leven said the neighborhood expressed support for the massing of the new structure. A continuous band expressing a structural truss and its sawtooth rhythm was originally conceived as a mechanism for hanging lower floors above the historic facades. While the expression will likely remain, its may not have a structural component. "We must think realistically about the budget," Leven said. Green roofs and walls abound throughout the new building, including a wall along 125th Street covered in hops to be used by the Harlem Brewing Company which will operate a brewery in the new building. Harlem Brewing will offer tours of their new facility and run a tap room and gift shop. More traditional green roofs including a landscaped courtyard for Carver Federal Savings Bank, the nation's largest African-American-operated bank, can be found on the larger building. Councilman Robert Jackson praised CREATE @ Harlem Green in a statement, “I am thrilled that this development, which is consistent with the vision of the community for this neighborhood, is moving forward. It will re-activate an important site in our community, and bring hundreds of good jobs to the people of Harlem.” Before construction can begin, the project must move through public review. Developers must also complete assembling their team and evaluating conditions on the site to help with foundation design.